I rooted this plant from a stem someone discarded. The stem is about an inch and a half diameter and the leaves are 8-10 inches long. Each time a new leaf appears (there are always 7 healthy large leaves)the bottom leaf starts to turn brown and dies. The plant is now about 20 inches high. 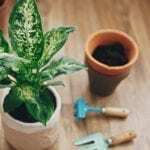 We have long experience with dieffenbachia and they always grew to several feet high, well covered with leaves. No sign of bugs or other problems, and the pot appears to be the right size. Our care of the plant definitely is in accordance with your instructions and we hope you know the secret to solving our problem. Thanks in advance for your help. Bottom leaves often do not receive enough sunlight. Try lifting up the plant and rotate it so it receive sunlight evenly.